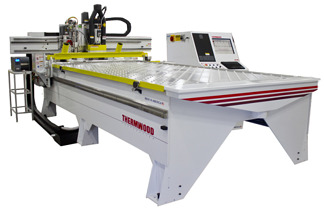 This video shows a Thermwood Model 45 CNC Router equipped with a Nemi Pod System machining a hardwood door out of poplar. 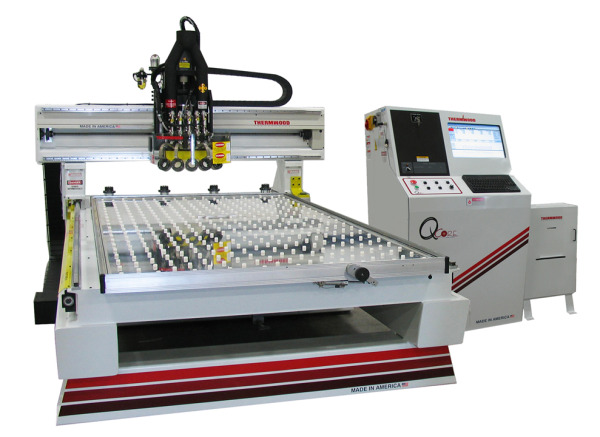 The Model 45 is a heavy-duty three axis CNC Router designed for nested-based production. Available in either single or dual spindles with optional rotary axis. Featuring fixed table sizes from 5'x5' to 7'x12', it has a 12HP HSD Spindle (3,000-24,000RPM) - optional 18HP HSD Spindle available. If you want the ability to create any type of custom cabinets you can conceive, as well as closets and custom furniture, we have a solution for you. 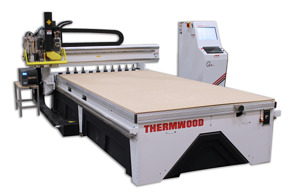 eCabinet Systems paired with Thermwood's CNC routers (featuring smart-router technology) allow you to program and run anything you can imagine and design, while offering total flexibility and absolute control of the entire process. Although our CNC systems work with just about any cabinet design software, eCabinet Systems software is so well integrated with the machine control that production is smoother, problems are fewer and profit is much higher. Systems are available for custom or high volume custom nested based cabinet production. A great custom cabinet package is the CabinetShop 43 paired with eCabinet Systems. This high-performance CNC router, comes standard with Thermwood’s smart-router technology as well as a fully stress-relieved rigid steel structure. Table sizes range from 4’x’8 up to 5’x20’ and it comes with an 11 position automatic tool changer as standard. 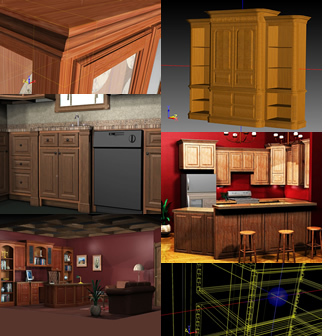 This solution allows you to quickly and profitably produce any type of custom cabinets you can imagine and design, as well as a lot more. 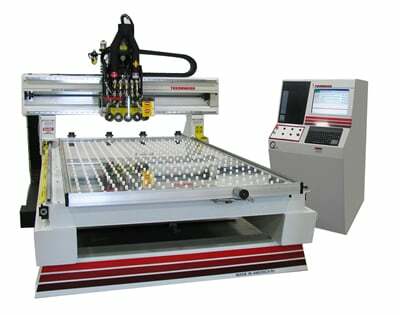 For high-speed/high-volume nested-based CNC routing, the AutoProcessor series is another excellent option. This heavy-duty system comes standard with auto-labeling and auto-load/offload to increase throughput and cut down on labor. Table sizes range from 5’x10’ to 7’x12’ and it comes with a standard 10 position rotary automatic tool changer. With a rapid speed of 4100 IPM and a 6000 lb automatic lift table for loading material, the AutoProcessor series is a very fast and extremely tough solution for nested based feed through machining. This is part four in our blog series demonstrating some of the ways that modern smart-routers can make your job easier as well as help save you money. Maintaining a good working spoilboard surface with ordinary routers is involved and prone to problems. 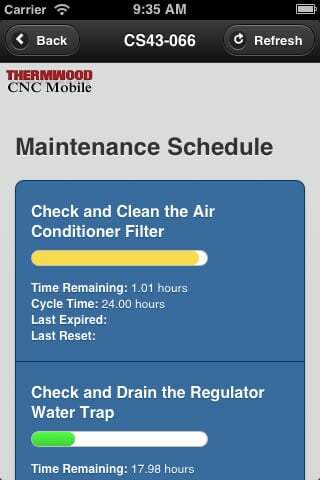 With a smart-router, this process is automated and easy. 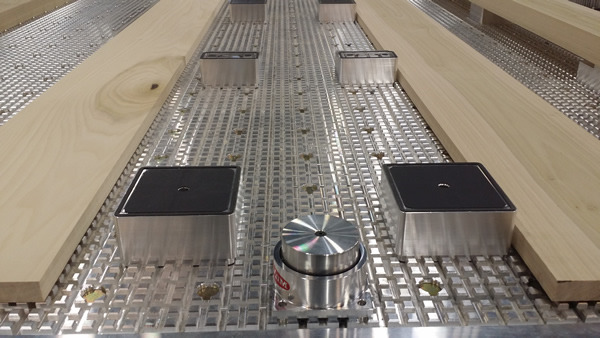 If you need to flycut the spoilboard in the middle of a job, just press the "Flycut" buttom on the control and the smart-router will automatically walk you through the steps. This can save a lot of hassle by allowing you to quickly level the surface of your spoilboard at any point in the job. Smart-routers live on the web. They access updates on the web, are serviced through the web and let you monitor and manage your smart-router using your smart phone or tablet. The ability to request a service phone call from a support technician right from your device. This is part three in our blog series demonstrating some of the ways that modern smart-routers can make your job easier as well as help save you money. Replacing bad or scrap parts is really easy with a smart-router. At the end of a job, simply scan the labels of any parts you want to recut and the machine nests them on any material still on the table so you can recut them. This saves a lot over having to create new CNC programs to make replacement parts. With a smart-router you can even add parts from previous jobs to a new job, provided you are running the same material (it monitors that for you). When replacement parts from another job are cut, a red bar on the label lets you know this part is for a different job. 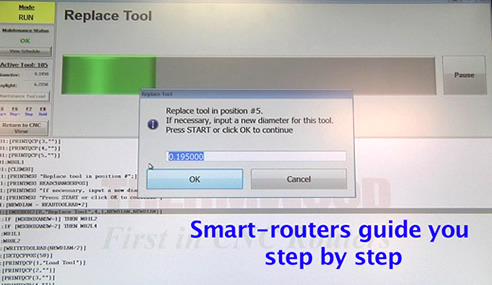 During program operation, smart-routers tell you what they are doing and offer instructions every step of the way. They tell you how many steps are in the program,what step they are on and what step is coming up next. If you can read you can run a smart-router. This is part two in our blog series demonstrating some of the ways that modern smart-routers can make your job easier as well as help save you money. 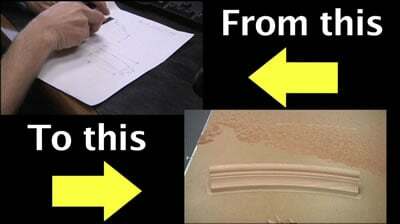 This feature can save you a lot of material, which in turn can save you a lot of time and money. When using this feature on nested based jobs, a smart-router saves you money by reducing the amount of scrap material that is wasted. This in turn saves you a substantial amount of money, and ordinary routers just do not focus on this area. They rely on the user to take care of checking the material for flaws, and this means that the operator must be both skilled and well trained to work within the limits of these systems. Smart routers address areas like this in a big way - they address the areas where you spend the most money because that’s where you can make the most money. Ordinary routers may seem less expensive at first, but may prove to be much more expensive in the long run. Smart-routers can machine a profile edge without a profile tool, by tracing over the edge multiple times with standard tools. It even works on curved moldings. This saves a lot for any shop that makes custom moldings by allowing you to use Profile Modeler to quickly create a molding or custom shape from a sketch or drawing with no special shaped tooling required. Today's smartphones are essentially handheld computers that also make phone calls. The speed of technological advancement in this area has been nothing short of phenomenal over the past decade. Not so with CNC routers. There has been the occasional improvement here and there, but not until recently with the introduction of the modern smart-router, has a CNC router come along that does much more than just route parts. A modern smart-router saves material and labor and is really easy to use. The intial cost may be a little bit more than a traditional "dumb" router, but the benefits make it an overall much better investment for nested-based manufacturing. With standard routers, the operator must remain close to the control so he can stop the machine if something goes wrong. The only job he can really do is watch the machine. With a smart-router, a pause button clips to his belt. Pressing it anywhere in the production cell stops the machine. It works like an emergency stop, but is not a “wrench in the gearbox” emergency stop. It immediately stops the machine, but offers options. 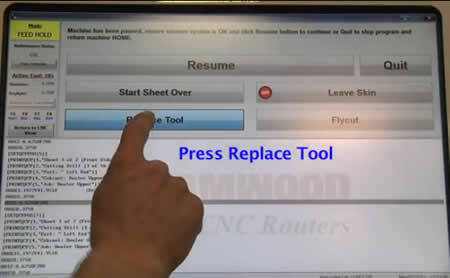 With this feature, the operator is free to perform other tasks away from the control. A progress bar, visible from a distance, shows the operator how long before he needs to service the machine. It’s like getting an extra worker for free. More info on this feature. One great feature of a smart-router is the ability to recover from a broken tool without scrapping the sheet you are cutting or restarting the job. This can save a lot of time, effort and money. If a tool breaks, press the Pause button to stop the machine. Then select the Replace Tool option on the control, and the smart-router drops off the tool holder and notifies you to replace the tool. The machine then picks up the new tool, automatically measures it, adjusts the program for the new tool length, recuts the path of the broken tool and continues with the job. More information on this feature. Smart-routers may very well be the next wave in CNC routers. Just like smart phones have replaced regular phones, smart-routers may replace regular routers. Why? Because they are a lot easier to use and they make a lot more money from nested based jobs. The big difference with smart-routers is not only do they know how to move, they also know the job they are doing. They can help in ways no simple machine can. 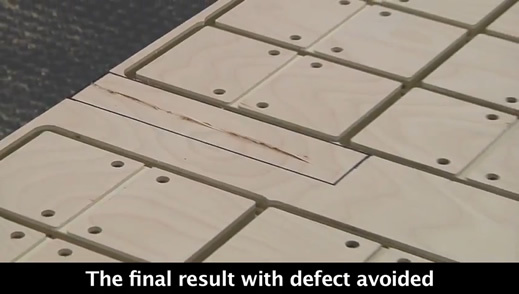 For example, when a smart-router finishes a job, it already knows how to make every part in that job, so if you need to cut a replacement part, the smart-router can do it without creating a new CNC program. In fact, they remember parts from all previous jobs. 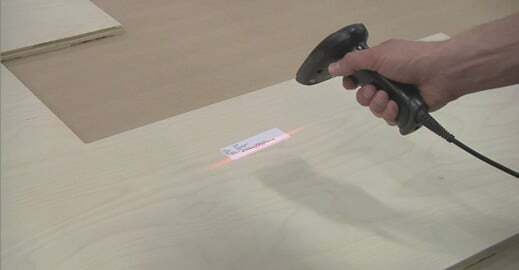 Just scan the label and it will cut it from the material left on the table. And, mentioning material left from a job, smart-routers use that material first when cutting a new job. You no longer have to throw it away or create specialized CNC programs to deal with it. It’s quick, easy and virtually automatic. It’s simple and saves the average shop thousands, if not tens of thousands of dollars in material each year that would otherwise be scrapped, and we’ve just scratched the surface. Just like a smart phone handles dozens of daily tasks through special apps, smart-routers handle dozens of aspects of running nested based products. The list is impressive and each feature saves labor, saves material, avoids scrap and makes the whole thing so much easier. Please click here for a detailed list of some of these smart-router features. If you would like to see just how much a smart-router can save you compared to an ordinary router, please give us a call at 1-800-533-6901 and we will sit down and go over it in detail. 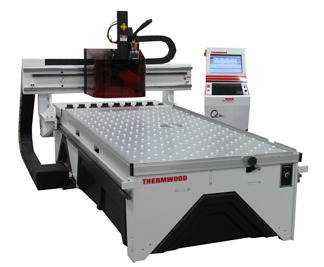 Thermwood's Profile Modeler allows you to quickly create a molding or custom shape from a sketch or drawing on a Thermwood CNC Router with no special shaped tooling required. This video demonstrates using Profile Modeler to create a custom curved cherry molding from Sketch - to Profile Modeler - to Machine - to Completed Shape. For more information on Profile Modeler or any of our other products, please click here or contact us at 1-800-533-6901.